The main feature of the Puri Rath Yatra festival, which happens in July every year in Odisha, is the towering temple-shaped chariots that carry the three deities from the Jagannath Temple. The chariots are an architectural marvel. What's really fascinating is the detailed process by which the chariots are newly made every year. It's a labor of love for around 200 carpenters, helpers, blacksmiths, tailors, and painters who work tirelessly according to a strict 58-day deadline. The craftsmen don't follow written instructions. Instead, all the knowledge is handed down from generation to generation. Only one family of carpenters ​​has hereditary rights to the construction of the chariots. The process takes places in various stages, each coinciding with an auspicious festival on the Hindu calendar. Some of the main stages are as follows. The wooden logs are supplied free of cost by the Odisha state government. They're delivered to the area outside the Jagannath Temple office on Vasant Panchami (also referred to as Saraswati Puja), the birthday of Saraswati the goddess of knowledge. This takes place in January or February. Over 4,000 pieces of wood are required to make the chariots, and the government started a plantation program in 1999 to replenish forests. The cutting of the logs to the required sizes gets underway at sawmills on Ram Navami, the birthday of Lord Ram, in March or April. Chariot construction takes place at the front of the royal palace near the Jagannath Temple in Puri. It commences on Akshay Tritiya, a particularly auspicious occasion in April or May. It's believed that any activity started on this day will be fruitful. It also marks the beginning of Chandan Yatra, a 42-day sandalwood festival at the Jagannath Temple. Prior to the commencement of construction, the temple priests gather to perform a holy fire ritual. The priests, dressed in bright attire, sing and carry garlands that are delivered to the chief carpenters. The work on all three chariots begins and ends simultaneously. It starts with the wheels, resembling the large, round eyes of Lord Jagannath. A total of 42 wheels are required for the three chariots. The wheels are affixed to the principal axles on the last day of Chandan Yatra. Devotees come in droves to pay homage. Great care and attention is given to the decoration of the chariots, highlighting the superb craftsmanship of the artisans of Odisha. The wood is carved with designs inspired by Odisha temple architecture. The frames and wheels of the chariots are also colorfully painted with traditional designs. The canopies of the chariots are covered in approximately 1,250 meters of intricately embroidered green, black, yellow, and red cloth. This dressing of the chariots is carried out by a team of tailors who make cushions for the gods to rest on as well. On the day before the festival starts, in the afternoon, the chariots are dragged to the Lions Gate entrance of the Jagannath Temple. The next morning, on the first day of the festival (known as Sri Gundicha), the deities are taken out of the temple and installed in the chariots. 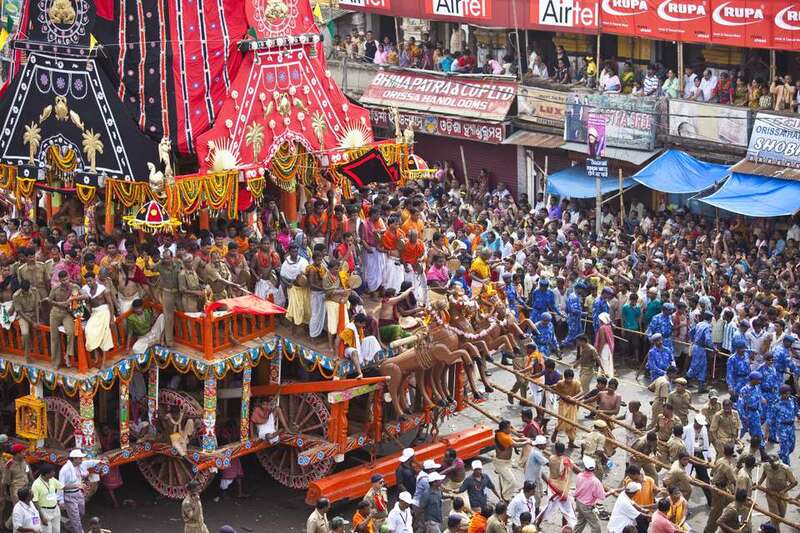 What Happens to the Chariots After the Rath Yatra Is Finished? 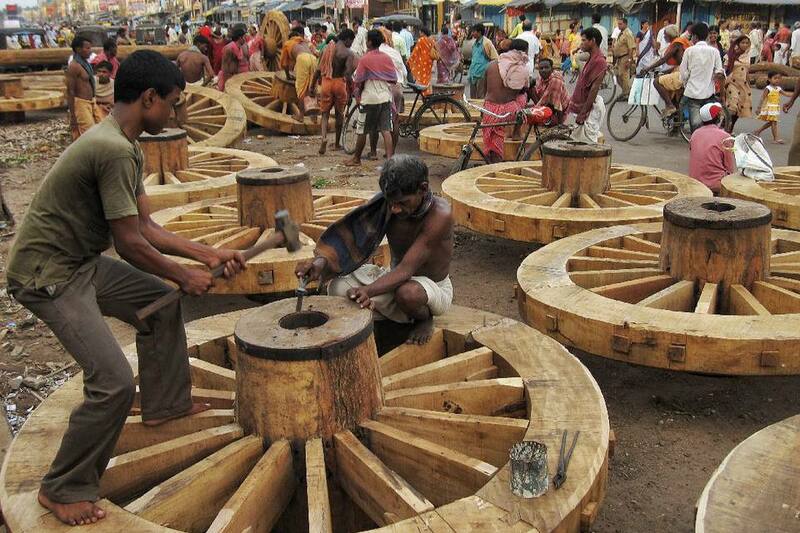 The chariots are dismantled and the wood is used in the kitchen of the Jagannath Temple. It's considered to be one of the largest kitchens in the world. A remarkable 56 types of mahaprasad (devotional food) are prepared there, in earthen pots over fire, for offering to Lord Jagannath. The temple kitchen has the capacity to cook for 100,000 devotees per day. Chariot Height: 45 feet, six inches. Number and Height of Wheels: 16 wheels measuring six feet in diameter. Chariot Colors: Yellow and red. (Lord Jagannath is associated with Lord Krishna, also known as Pitambara, "the one draped in golden yellow robes"). Chariot Name: Taladhwaja -- meaning "one with the palm tree on its flag". Number and Height of Wheels: 14 wheels measuring six feet six inches in diameter. Chariot Colors: Green and red. Chariot Name: Debadalana -- meaning literally, "trampler of pride". Chariot Height: 44 feet, six inches. Number and Height of Wheels: 12 wheels, measuring six feet eight inches in diameter. Chariot Colors: Black and red. (Black is traditionally associated with female energy shakti and the Mother Goddess). The temple-shaped chariots in the Puri Rath Yatra festival have special meaning. The concept is explained in the holy text, the Katha Upanishad. The chariot represents the body, and the deity inside the chariot is the soul. Wisdom acts as the charioteer that controls the mind and its thoughts. There's a famous Odia song that says that the chariot merges and becomes one with Lord Jagannath during the festival. Simply touching the chariot or rope that pulls it is believed to bring prosperity. Not only are the chariots in the Rath Yatra festival made out of wood, but the three deities (Lord Jagannath, his elder brother Balabhadra and sister Subhadra) are as well. They're hand carved usually every 12 years (although the shortest period has been eight years and the longest 19 years) in a process known as Nabakalebara. This means "new body". The festival takes on added importance in the years that this happens. The last Nabakalebara ritual took place in 2015. (Note that the image is representational, and is not of the actual Jagannath Temple idols).